KiiTO Reviews - Is It a Scam or Legit? KiiTO is a plant-based protein drink brand that promises to keep you satiated between meals and fortified at the end of workouts, all while boosting your metabolism so you burn more calories. KiiTO Review: Will It Help You Burn More Fat? 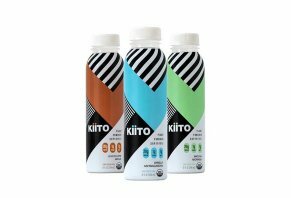 Based in L.A., KiiTO is a plant-based protein drink that features organic ingredients. The beverage claims to provide your body with plant-based protein, brain-boosting superfoods, and MCTs for boosting your physical capabilities. The company website tells us that this ‘super fuel’ beverage has a category-leading plant protein to sugar ratio of 20g to 1g, meaning that the drink will help your body burn fat more efficiently. This low-sugar energy drink promises to promote an active mind and keep you focused on what’s in front of you, and the company states that they use only clean, high-quality ingredients. Do these claims match what they’re really selling? Let’s look closer at the promises this plant-based drink makes. What Ingredients Are in KiiTO? At the time of writing, KiiTO offered three energy drink varieties: Vanilla Ashwagandha, Chocolate Maca, and Matcha Moringa. They are designed to be a healthy option for staying full between meals, refueling after workouts, or satisfying a sugar craving so you don’t reach for dessert. The company states that the key ingredients within each drink are coconut milk MCTS, a variety of superfoods, and pea protein. Equally notable are the compounds that KiiTO claims their beverages don’t contain, including added sugars, artificial flavors, xanthan gums, gluten, dairy, and soy products. The company says that these ingredients can weigh you down physically, trigger cognitive decline, and trigger digestive issues. So what’s included instead? Below are the full ingredient lists for all three KiiTO flavors. Unpacking these lists, it’s clear all three drinks contain the same base ingredients, including coconut milk, pea protein, Himalayan pink salt, cinnamon oil. According to Healthline, MCT’s (medium chain triglycerides) are metabolism-boosting saturated fats that make it easier to burn calories. KiiTO drinks contain MCT in the form of organic coconut milk, which they state will help support the development of healthy hair, skin, nails, and brain function in those who drink it. Each KiiTO drink contains 20 grams of pea protein per serving, which Healthline tells us is a high-quality form that’s also a good source of iron. While animal proteins are typically the easiest for humans to handle, pea protein is considered to be some of the best plant-based sources in regards to digestion. Ashwagandha: According to WebMD, ashwagandha is a plant that’s used in a variety of ways to boost health, and it can improve your ability to think and cope with stress. Maca: Medical News Today tells us that Maca is a Peruvian plant in the cruciferous (leafy greens) family that is often ground up and added to drinks to boost energy and endurance, though it also has purported benefits for improving libido. Matcha: From our previous research on matcha, we’ve found that this prized form of powdered green tea is considered a superfood because of its high polyphenol content, as well as its impressive levels of epigallocatechin gallate (EGCG), vitamin A, B complex C, E, and K, and fiber content. The tea is also praised for providing your body with a slow release of caffeine energy that leaves you less jittery than drinking coffee. Moringa: WebMD reports that moringa is a plant native to the Himalayas and valued for its nutritional content. In some cases, it’s eaten as a way to prevent malnutrition in impoverished regions. The plant’s extract can help you lower your risk of developing numerous health problems, including headaches, thyroid disorders, and anemic blood. What Do KiiTO Drinks Cost? At the time of writing, KiiTO offered all three drink options for sale on their website and in retail locations throughout LA. It’s possible to buy the drinks as a one time purchase in cases of 12 for $65, or you can save 10% by signing up for a subscription for deliveries every one to four weeks. If you’re struggling to choose a flavor, the company also offers a mixed case of 12 that contains four of each flavor. For those looking for a plant-based protein drink, there are plenty of options to consider besides KiiTO. Two we felt were worth comparing included Orgain and OWYN. Orgain is an organic plant-based protein powder that’s sold pre-mixed and by the cannister so that you can blend up your own energy drink. The drink gets its 21 grams of protein per serving from peas, chia seeds, brown rice and fiber, and you’ll pay between $1.15 and $1.50 per serving, which makes it approximately a fifth the price of KiiTO drinks. OWYN brands itself as a vegan protein shake that’s free of gluten, soy, nuts, and eggs, which makes it similar to KiiTO. The drink owes its 20 grams of protein per serving to a proprietary blend of pea protein, pumpkin seed protein, and flax oil. One significant difference between the two is that OWYN doesn’t contain coconut oil. This might be a plus for those who aren't sold on coconut oil’s benefits, though the drink doesn’t offer any other MCT ingredients. Pricewise, you’ll pay $15.56 on Amazon for a four-pack of OWYN, which comes to $3.89 per drink. In comparison, KiiTO costs $5.41 each. This makes KiiTO the most expensive protein drink we looked at, even though all three had an almost equivalent protein content and contained similar ingredients, though OWYN and Orgain both lacked the superfood ingredients that KiiTO contains. Our View: Should You Drink KiiTO? As this article highlights, KiiTO is an emerging energy drink that focuses on plant-based ingredients that are often organic. The brand promises that each serving gives you a good supply of easily digestible protein and MCTs to boost your metabolism so you burn more calories. We haven’t tried this beverage for ourselves, and we couldn’t find any customer reviews for it at the time of writing, so we can’t speak to its taste or effectiveness on a personal level. However, the beverage has similar ingredients to other leading plant-based protein drinks, and it contains almost the same amount of protein per serving as two competitors, Orgain and OWYN. KiiTO is significantly more expensive than the other drinks we looked at, as it costs more than $5 per can. That being said, the plant protein competition didn’t contain coconut oil, ashwagandha, maca, matcha or moringa, and these oft-labeled superfoods might be a selling point for you. I ordered a mixed case to try each flavor. The product arrived with ice packs and was encased with insulated protection to keep refrigerated (although it was 20 below temp when it arrived, so that was not an issue). I have now tried all three flavors and surprisingly the Green Tea is my favorite followed by Vanilla and Chocolate. What I notice about KiiTO is that I feel satisfied after finishing the 12 ounces - each one has been consumed quickly, and admittedly I would have liked a little more. I also notice an energy boost - somewhat similar to having a bulletproof but not as pronounced since there is little or no caffeine. It is hard to find healthy beverages, especially with little or no sugar, so I have been very pleased. They are great after an intense workout. Write a Review for KiiTO!